When Laurits Andersen Ring (1854–1933) returned from his tour of Italy, he could so easily have fallen into another bout of depression. His desperately unrequited affair with Johanne Wilde had ended in 1892, and Henrik Pontoppidan’s public disclosure of that had shattered their friendship. Instead of slipping into decline, over the next decade Ring painted many of the finest works of his whole career, indeed of any painter of the day outside France. The catalyst to his success was the twenty year-old daughter of his friend, the ceramics designer and potter Herman H. Kähler: Sigrid (1874-1923), who was more than twenty years younger than him. While developing her own skills as a painter, she modelled for Ring, became his muse, and in 1896 the couple married. Here’s a small selection of Ring’s best paintings from the first decade of their partnership. 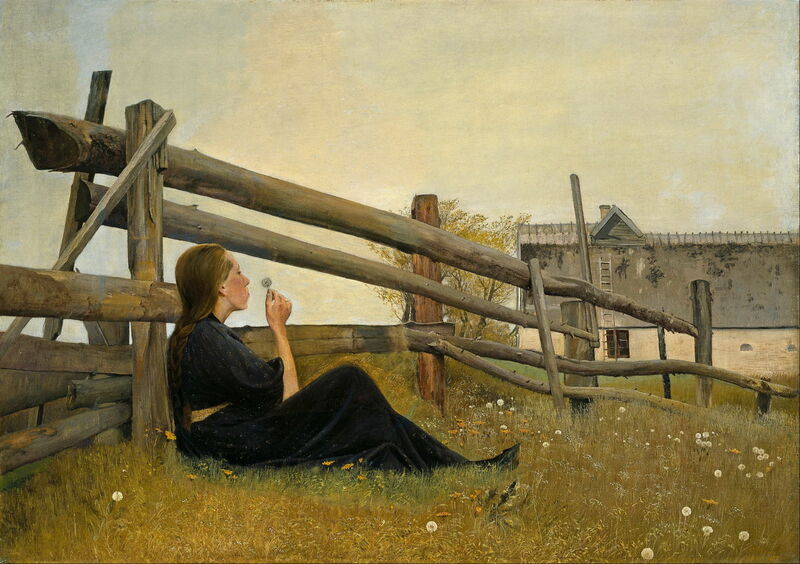 Laurits Andersen Ring (1854–1933), Spring. 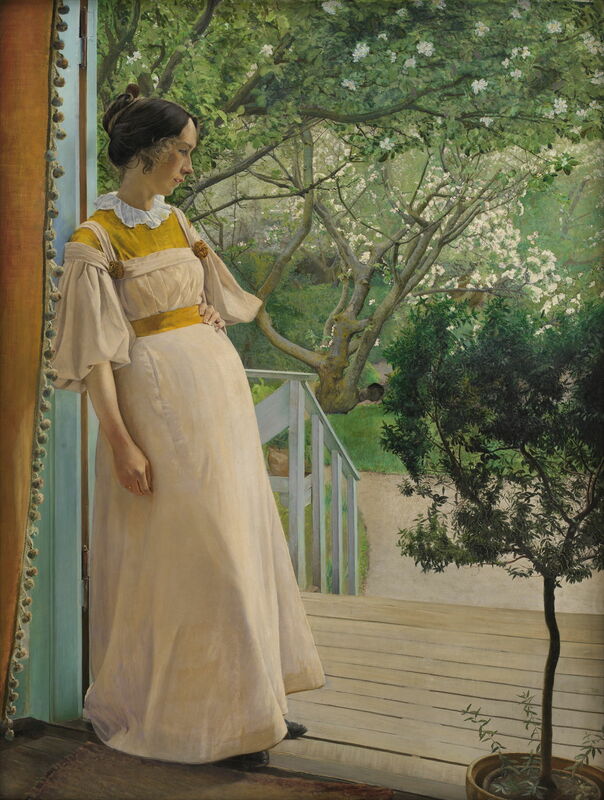 Ebba and Sigrid Kähler (1895), oil on canvas, 189.5 x 159 cm, Den Hirschsprungske Samling, Copenhagen, Denmark. Wikimedia Commons. Spring. 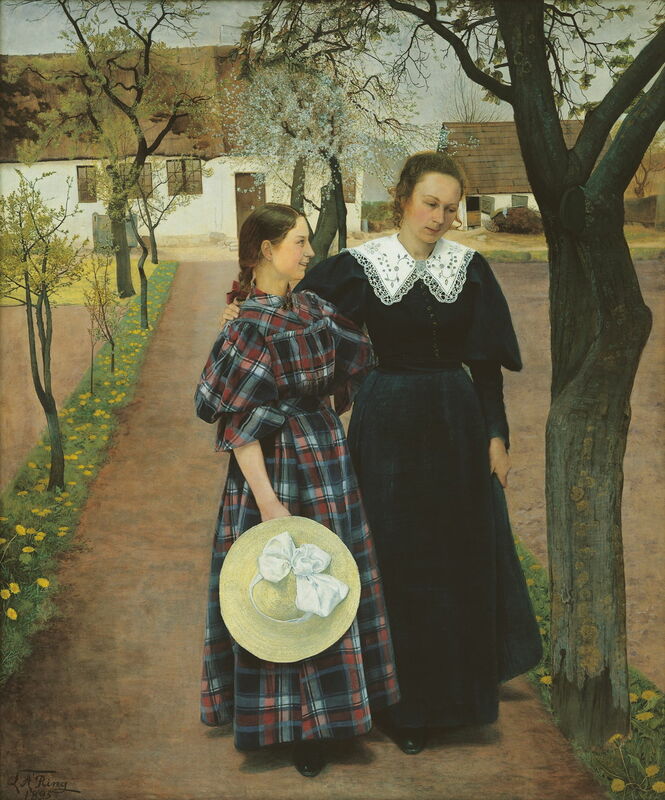 Ebba and Sigrid Kähler from 1895 appears to show a mother and her daughter talking in their garden, but the two are in fact sisters. At the right is Sigrid, the year before her wedding, at the left is her sister Ebba, who was fifteen at the time. Ring uses a very light touch with the blossom and spring flowers to avoid them dominating the figures. This was exhibited at the Exposition Universelle of 1900 in Paris. 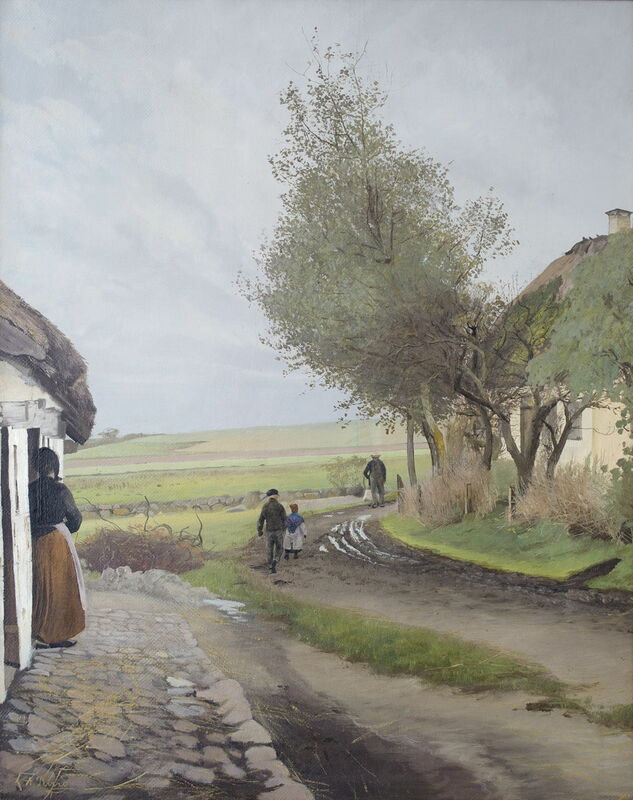 Laurits Andersen Ring (1854–1933), Father Coming Home (1896), oil on canvas, 74.5 x 59.5 cm, Statsministeriet, Copenhagen, Denmark. Wikimedia Commons. Ring continued to paint social realist, or Naturalist, works too. Father Coming Home from 1896 shows a mother and two children awaiting the return of their husband and father. He is still quite distant on the muddy track in this poor rural community in Denmark. At the French Windows. The Artist’s Wife from 1897 is justly thought of as one of Ring’s greatest paintings, and won him a bronze medal at the 1900 Exposition Universelle. Sigrid is noticeably pregnant here with their first child, a daughter. This was probably painted at the family home in Karrebæksminde, close to Sigrid’s father’s factory at Næstved on the island of Fyn (Funen). Laurits Andersen Ring (1854–1933), At Breakfast (1898), oil on canvas, 52 x 40.5 cm, Nationalmuseum, Stockholm, Sweden. Wikimedia Commons. 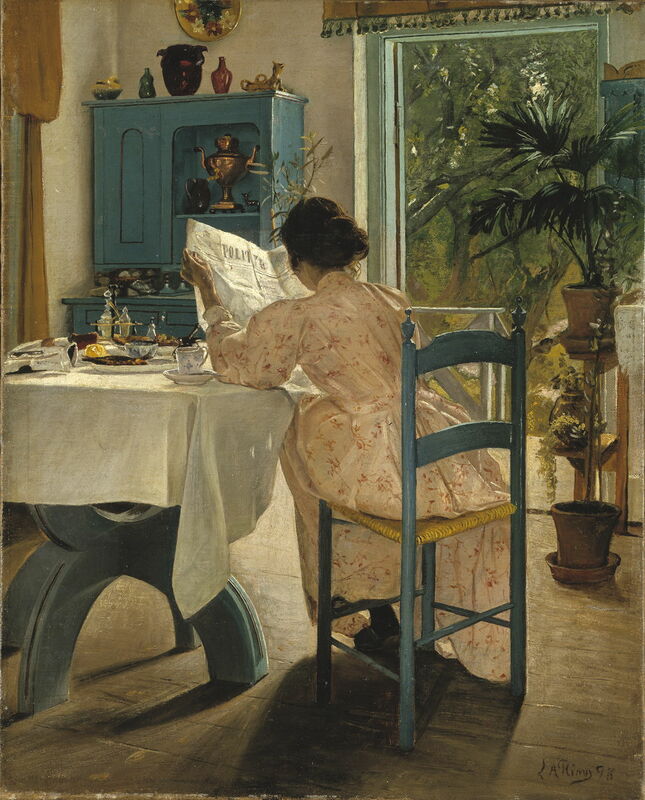 Sigrid is again the subject At Breakfast in 1898. She sits reading the ‘leftist’ daily newspaper Politiken in the sunshine. Ring had been an early subscriber to Politiken when it first started to publish in 1884; it played an important role in the formation of the Social Liberal Party in Denmark, and remains one of the country’s leading ‘broadsheet’ papers. 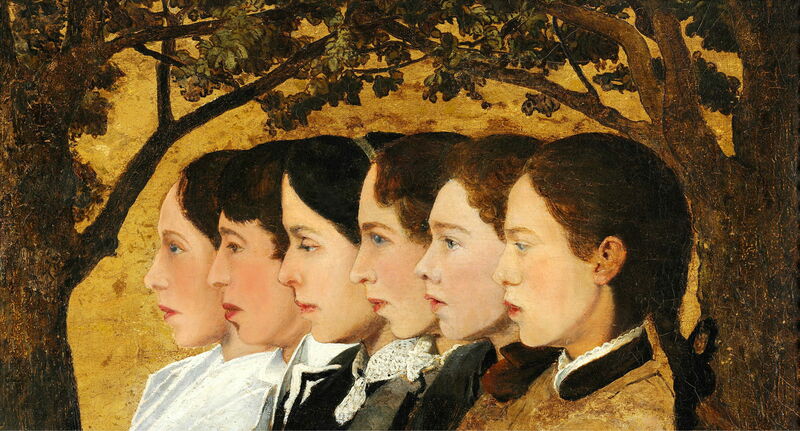 Laurits Andersen Ring (1854–1933), Six Portraits of Potter Herman A. Kähler’s Children (1898), oil on panel mounted on canvas, 30 x 53 cm, location not known. Wikimedia Commons. In 1898, Sigrid’s parents celebrated their silver wedding anniversary. For this, Ring painted this remarkable family portrait showing Six Portraits of Potter Herman A. Kähler’s Children. From the left are Sigrid, Herman Hans Christian, Hedevig, Ebba (seen in the first painting above), Elisabeth, and Stella. This may well have been influenced by some of the Renaissance multiple portraits which Ring must have seen when in Italy. The following year, Ring painted another outstanding work, In the Month of June (1899). Sigrid (I believe) sits blowing dandelion ‘clocks’ idly, her back resting on a patchwork fence, near a farm. This reminds me of some of the rural paintings of Anders Zorn from the same period, and of course the much later work of Andrew Wyeth. 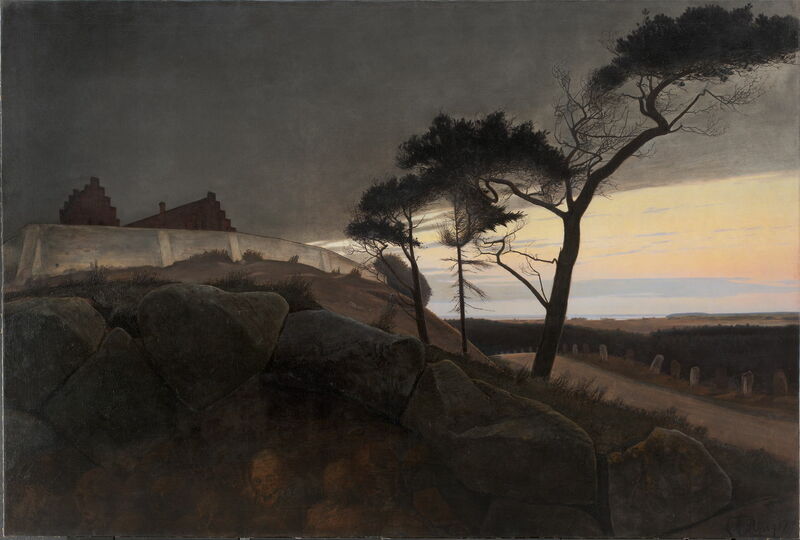 Laurits Andersen Ring (1854–1933), After Sunset (1899), oil on canvas, 158 x 235 cm, Statens Museum for Kunst (Den Kongelige Malerisamling), Copenhagen, Denmark. Wikimedia Commons. Ring still painted some pure landscapes, and those in which symbols of death are included. After Sunset from 1899 looks at first sight to be an unusual view of a country church just after sunset, but alongside the road at the right is a succession of tombstones, and the rock chamber in the foreground is packed with mummifying corpses, reminiscent of those which Ring had painted in Palermo, Sicily. The twisted old pine then takes on a more sinister appearance, as if influenced by Caspar David Friedrich, perhaps. Laurits Andersen Ring (1854–1933), A Man Digging Potatoes (1901), oil on canvas, 86 x 67.5 cm, Statsministeriet, Copenhagen, Denmark. Wikimedia Commons. 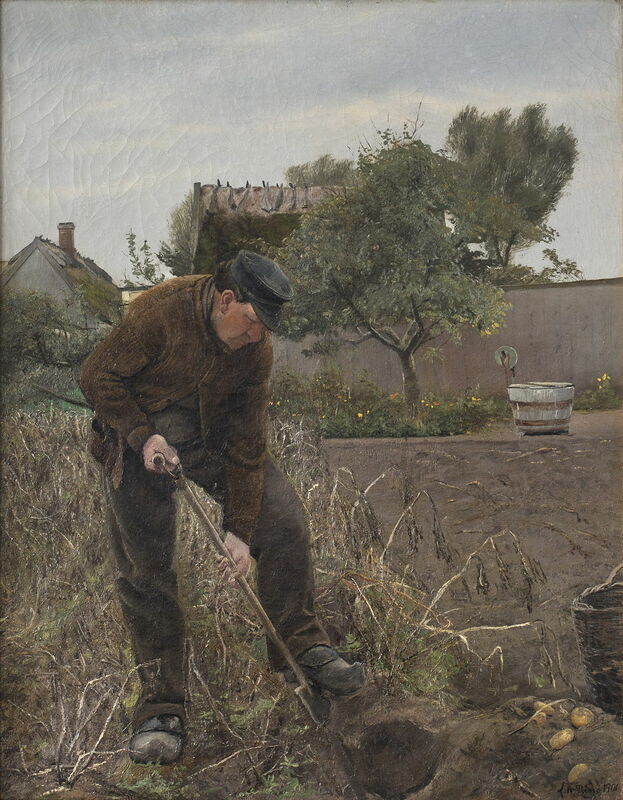 A Man Digging Potatoes from 1901 is pure social realism again, as this smallholder uses his spade to lift the potatoes which are his staple diet – as was the case for numerous people throughout Denmark, and many other countries in Europe at the time. I believe that the plants shown here have suffered from potato blight, which swept Europe periodically causing famine and death. 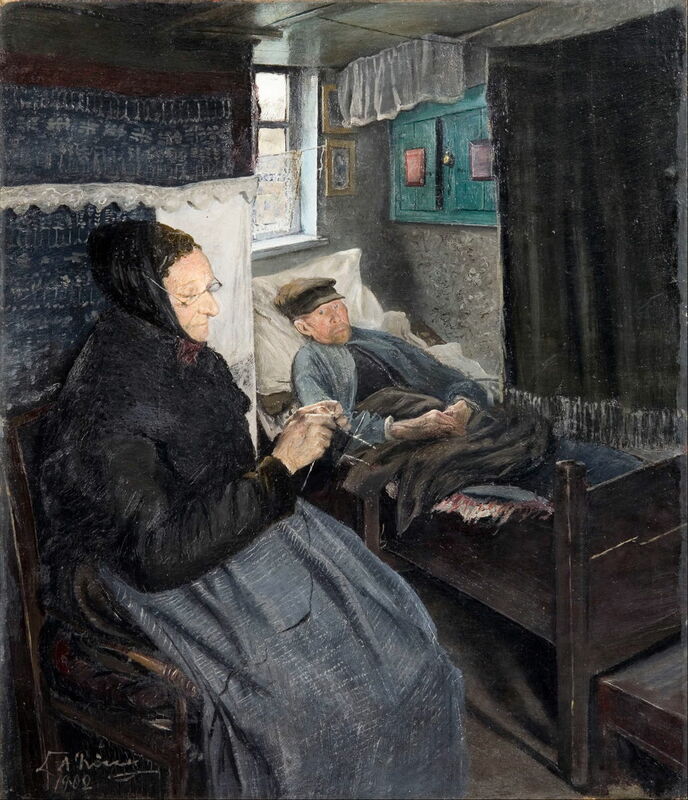 Laurits Andersen Ring (1854–1933), The Sick Man (1902), oil on canvas, 52.7 x 45.7 cm, Den Hirschsprungske Samling, Copenhagen, Denmark. Wikimedia Commons. This was followed by The Sick Man in 1902, which was bought the year after for the Hirschsprung Collection. The man stares grimly, wide-eyed and straight ahead, as if he is already looking death in the face. Meanwhile his wife sits knitting, already swathed in black apart from her apron. 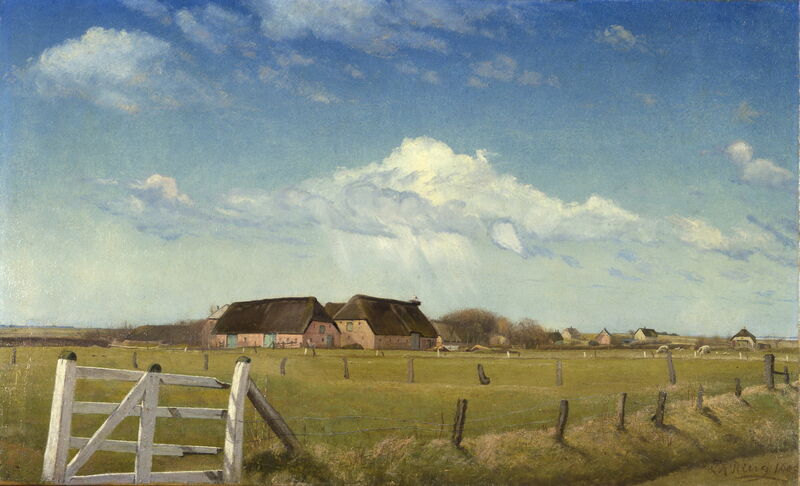 Laurits Andersen Ring (1854–1933), Fenced in Pastures by a Farm with a Stork’s Nest on the Roof (1903), oil on canvas, 57.5 x 94.5 cm, Private collection. Wikimedia Commons. As with other countries in Europe, farmland had been progressively enclosed by hedges and fences during the late eighteenth and nineteenth centuries. Fenced in Pastures by a Farm with a Stork’s Nest on the Roof from 1903 may therefore be a wonderfully widescreen landscape with social commentary on the continuing issues of enclosure and land reforms. Laurits Andersen Ring (1854–1933), The Artist’s Wife and Children (1904), oil on canvas, 83 x 102.5 cm, Statsministeriet, Copenhagen, Denmark. Wikimedia Commons. 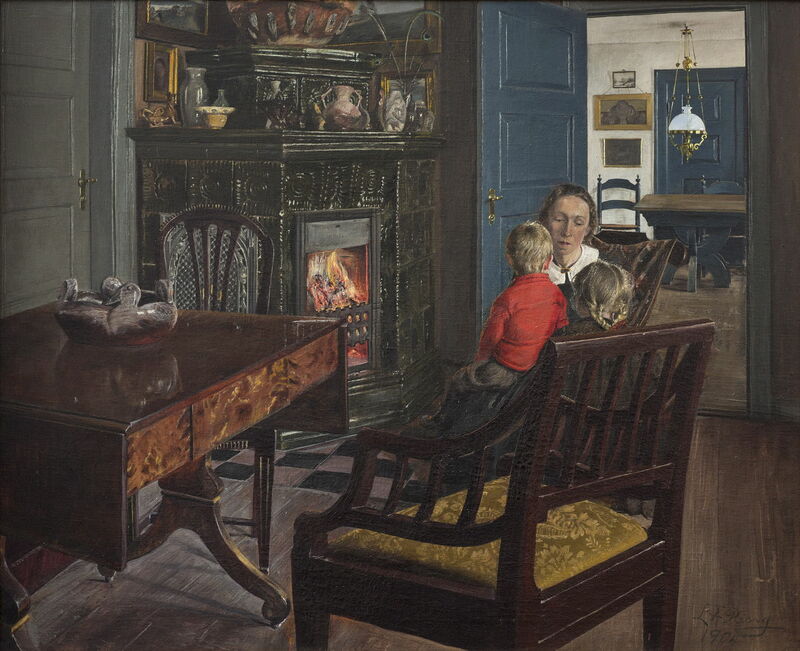 My selection from Ring’s paintings of 1904 is The Artist’s Wife and Children, which shows Sigrid with their young son and daughter, in front of a really roaring fire. By this time, Ring was well embedded in Danish art circles, and appears to have been comfortably off. In the next room is the same table which appeared in At Breakfast above, and the table in the left foreground has a carefully-polished surface which allows Ring to show subtle reflections. Laurits Andersen Ring (1854–1933), Housewife’s Evening Party (1905), oil on canvas, 72.5 x 87.5 cm, Statsministeriet, Copenhagen, Denmark. Wikimedia Commons. Ring’s social comment came with wit too: Housewife’s Evening Party from 1905 is a very different sort of party from those being painted by others at the time. 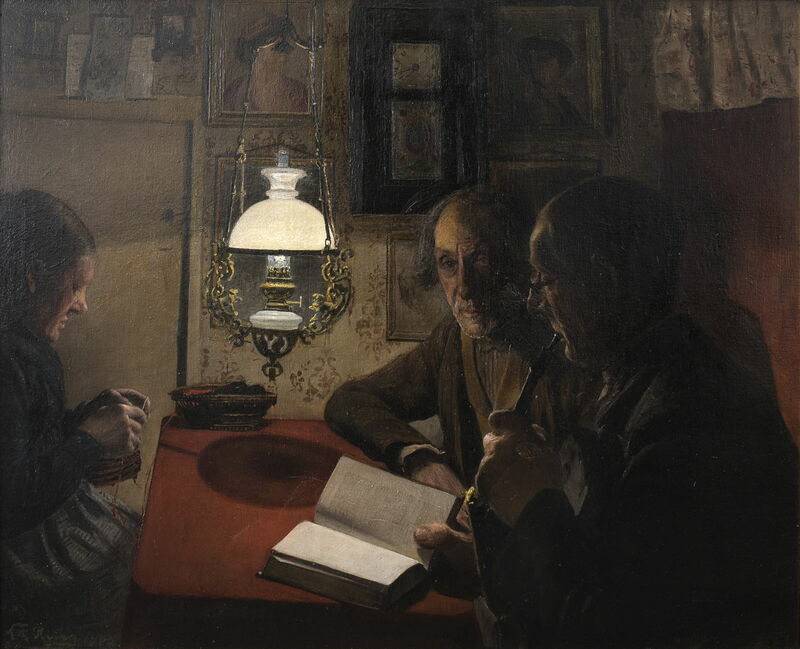 This housewife sits knitting, as her husband and a friend discuss a book by the light of the kerosene lantern. They are not poor by any means: there are portrait paintings on the wall, and a clock ticking softly above them, and the man holding the book draws on a large and ornate pipe. They are also clearly literate and educated people. But it’s a far cry from the life of the ‘young things’ in the cities. Laurits Andersen Ring (1854–1933), The bog at Carlsminde in Søllerød, Zealand (1906), oil on canvas, 64 x 96 cm, location not known. Wikimedia Commons. 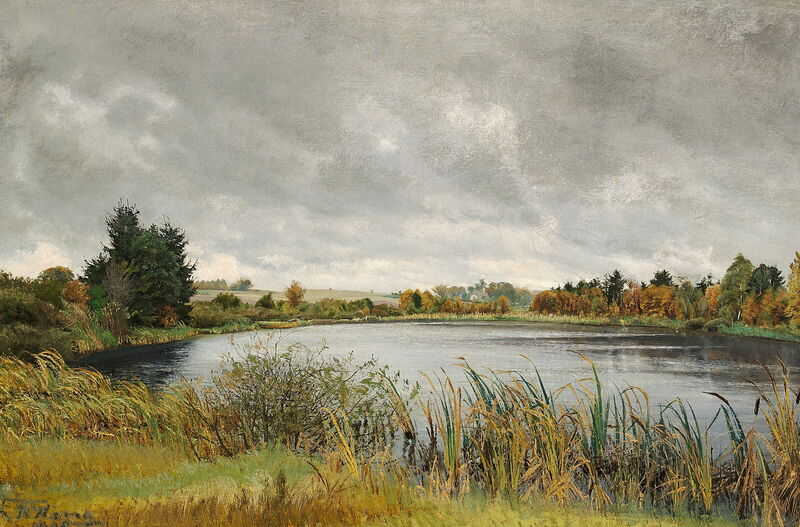 The bog at Carlsminde in Søllerød, Zealand from 1906 is one of Ring’s finest landscapes, although perhaps more appropriate of pre-Impressionist painting in the middle of the nineteenth century. It shows a lake in the grounds of a Baroque mansion in Søllerød, to the north of Copenhagen. The estate had been bought by Isak Glückstadt in 1903, who expanded it and had it landscaped, centred on this lake, with its stock of pike and tench. Glückstadt seems to have been eccentric, at one time keeping two Indian elephants there. Appropriately, in more recent years Carlsminde has been the headquarters of the Danish Liberal Party Venstre, which was Ring’s mature political alignment. Next week I will look at the careers and art of Ring and Brendekilde further into the start of the twentieth century. Posted in General, Life, Painting and tagged Andersen, Brendekilde, Denmark, Friedrich, Kähler, naturalism, painting, realism, Ring, Wyeth, Zorn. Bookmark the permalink. In love with color. Can’t believe these are painted. Thank you – they’re wonderful, aren’t they?